This remarkable grade I listed building has been known by several names during its long and interesting history. In the early 20th century, guides to Ipswich call it St Nicholas Meeting House. 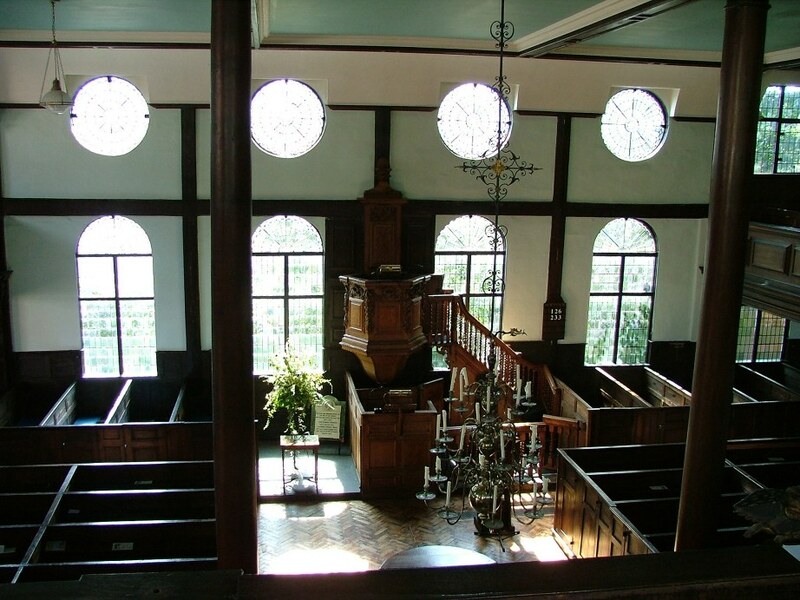 It was designated a church or chapel of various denominations through much of the 18th and 19th centuries, but to its founders, in the last years of the 17th century, it was a synagogue, a gathering place, where, to quote the sermon on 26th April 1700, the chapel's opening day, "we meet not only with one another, but all with God." Purpose-built dissenting chapels of this age are rare enough; the old chapel in Norwich bears some similarities. In Suffolk, the one at Walpole is older than this, but that is a converted cottage. 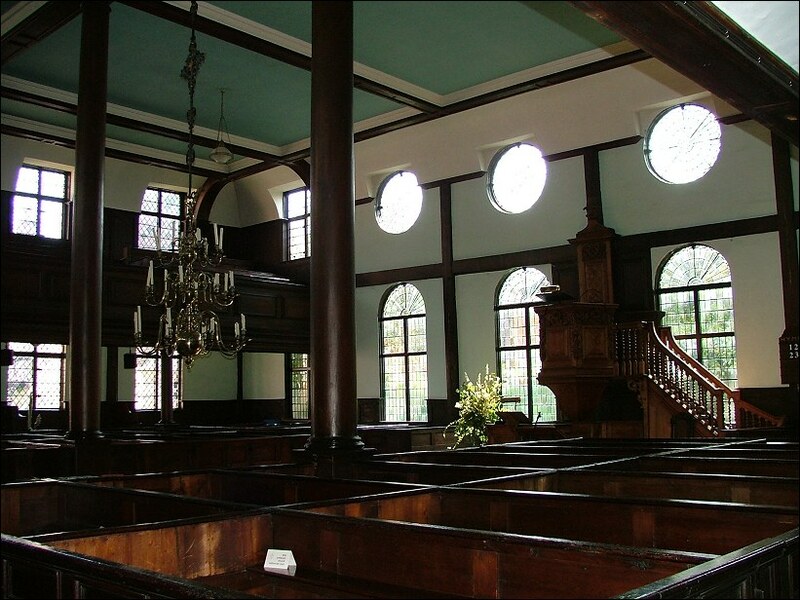 What makes Ipswich Unitarian chapel particularly unusual is that it retains almost exactly the original integrity and layout, apart from a major tidying up of 1900, when the current round and arched windows were put in, and some of the furnishings renewed. It is also the oldest surviving timber-framed chapel in East Anglia. Who were these dissenters, who built this chapel? During the turbulent years of the early 17th century, in the years leading up to the 1640s, when the Church of England was supressed, people subscribed to all manner of sects which today we would consider weird and wonderful - Brownists, Fifth Monarchists, the Family of Love, etc. You can read more about them on the entry for Walpole chapel. Some of the larger, more orthodox sects have survived and prospered; the Baptists and the Quakers, for instance. But in the former Anglican churches, once the established church had been abandoned, congregations usually allied themselves with either Presbyterianism, allowing for a wider form of Church government, or Congregationalism, remaining fiercely independent of other church communities. Presbyterianism would eventually become the established church in Scotland, and the English survivors became part of the United Reformed Church in 1960. So did many of the Congregationalists, but some of them continued to go their own way, in the manner of the 'Independents' they were once known as. When the parish churches returned to Anglican care in 1662, many of these congregations and their ministers were driven out. This seems to have bothered the Congregationalists less than the Presbyterians. 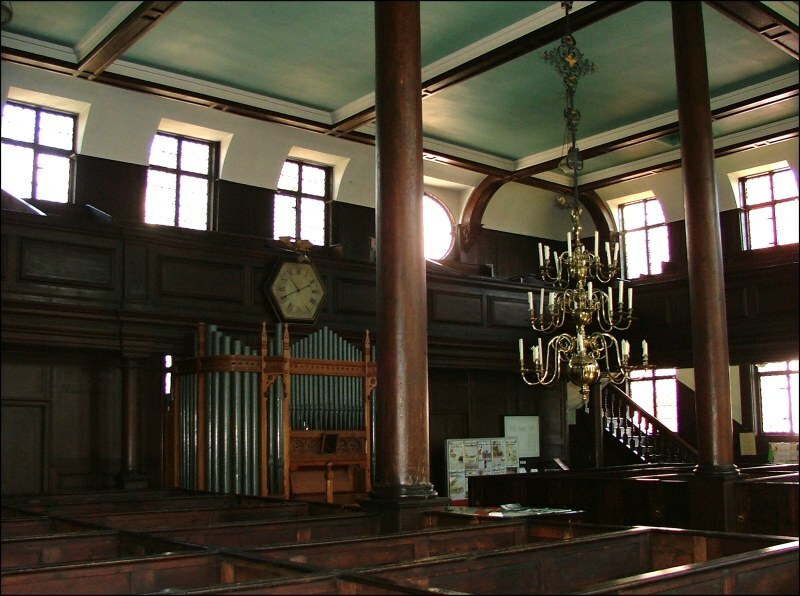 But the Act of Tolerance of 1689 encouraged many of these groups to set up their own worshipping communities, either in buildings adapted for the purpose, as at Walpole, or in purpose-built buildings, as here. The community here was of a Presbyterian hue: "Let none think", said their leader Thomas Fairfax, "that I have spoken a word to the derogation of our publick churches. Had we the liberty of those places, we should seek no other". The most excellent guide book asks us to imagine what worship was like in those early days. In the Puritan pattern, there were no musical instruments, and the only singing was of psalms. The congregation covered their heads when the word was read or preached, and talking, laughing, or 'indulging ourselves to sleep or giving liberty to wandering eyes, thoughts or affections' was frowned on. 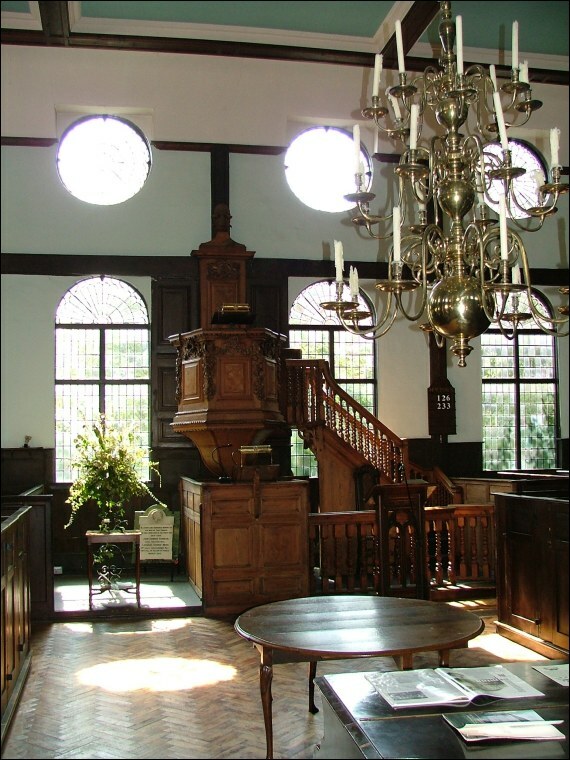 The men sat downstairs and the women upstairs, as in a Jewish synagogue. During the 18th century, the congregation moved away from the orthodox Trinitarianism of their tradition to a Unitarian position. Unitarianism was quite fashionable in the late 19th century; it was one of several fringe alternatives to those two great Victorian movements within the established Church, the Calvinist evangelical movement and the dogmatic certainty of the new Anglo-catholics. And so, to the building itself. Until the 1970s, it was severly hemmed in, and distant views were impossible. And then, Ipswich went mad, preparing itself to double in size. The new dual carriageway inner-ring road, quite out of scale with the town, swept past the chapel's back door (this has now been diverted, and the former road has become Cromwell Square).And then, most dramatically of all, the cluster of shops and pubs to the west of the building were all demolished, to be replaced by Norman Foster's remarkable Willis Faber building, England's first post-modern structure, whose black glass curtain walls reflect the chapel, as well as adjacent St Nicholas. If the Willis Faber building was in Paris, it would be as famous as the Pompidou Centre, and more popular. There are two sets of double doors (one with a spyhole) on this, the north side of the building, and you step into an entrance porch, part of the 1900 refurbishment. From here, we enter the chapel itself. The overwhelming impression is of wood - in the walls, floors and furnishings. The feeling is of a grander place than Walpole; it is self-confident, and the balcony towers over the inner space. A great brass candleabra hangs in the middle; astonishingly, it is the original one from 1700. Equally astonishing is that the clock on the north wall was also there on opening day. It still keeps good time. The only suspension of disbelief required is to blot out the round and arched windows - these date from 1900, and square ones were in their place before. Interestingly, they echo the arched windows at Walpole, which date from 100 years earlier. The focus of the chapel is the glorious Grinling Gibbons-style pulpit, not unlike that at nearby St Mary le Tower in its carving, although the arrangement is quite different, positioned as it is above a reading desk, with a long banistered stairway leading up to it. 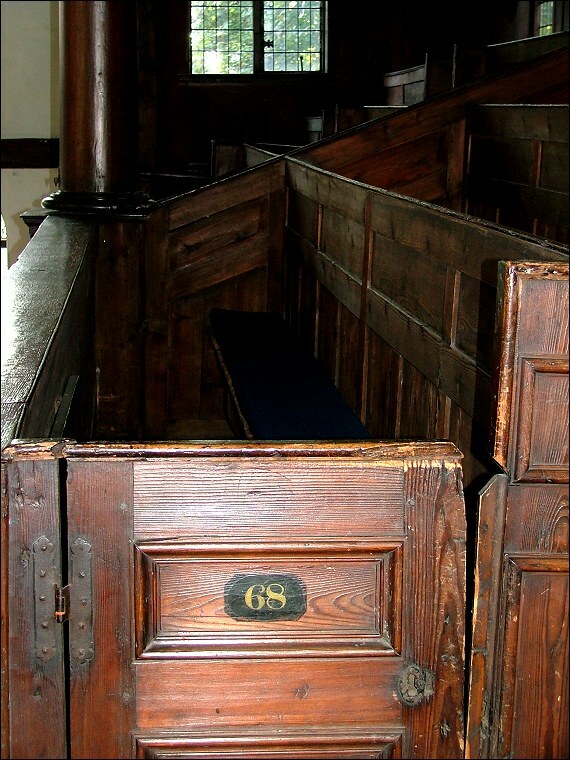 The box pews are high backed, and mostly focus on the pulpit, although this was not always the case. Many have numbers, a reminder of the days when families would rent out a pew on a regular basis. This continued here into the twentieth century. Great wooden central pillars are said to be ships' masts - the same story persists at Walpole. There is something pleasantly liberal and intellectual about Unitarian doctrine, something reassuring and easy to grasp in a secular world. It doesn't surprise me in the least that the congregation is holding up well where some other free churches are declining. 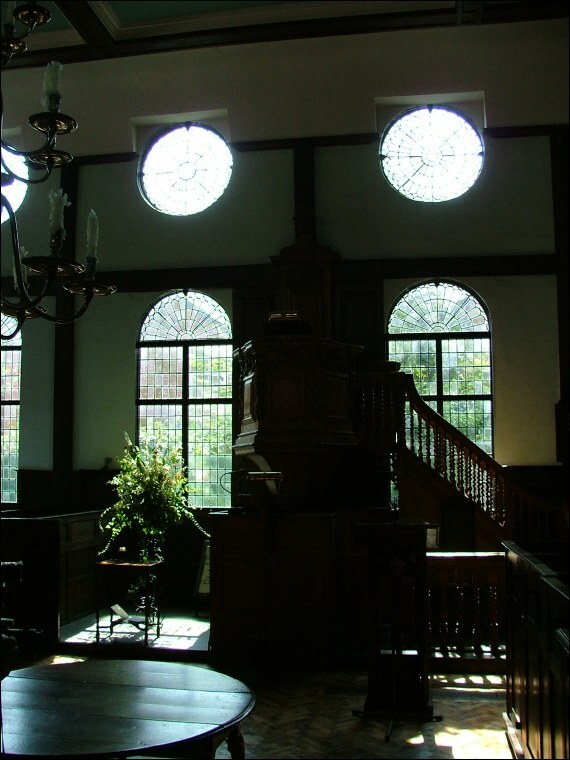 Perhaps, like the Quakers, Unitarian worship is at once accessible and attractive to agnostics in search of a liturgy. Mind you, the building probably helps. 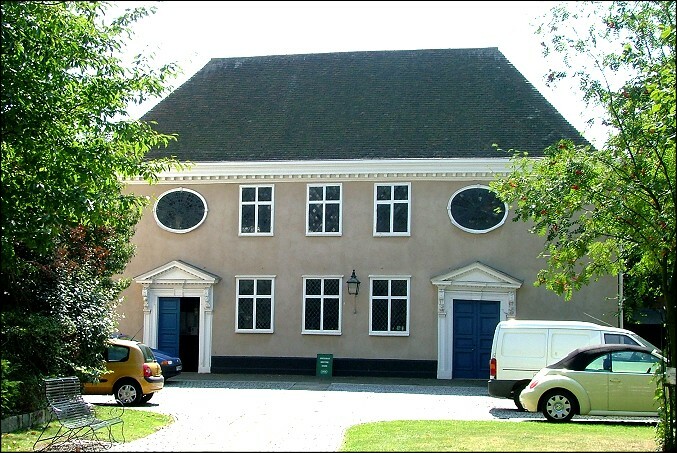 The Unitarian chapel, Ipswich, is located in Friars Street beside the Willis Faber building. It is open most Saturday mornings.